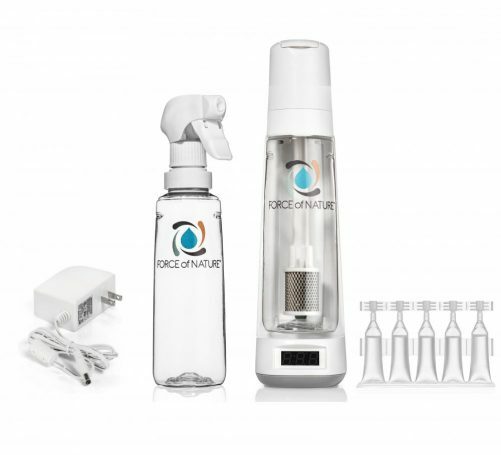 Get your home clean and ready for the holidays with Force of Nature! 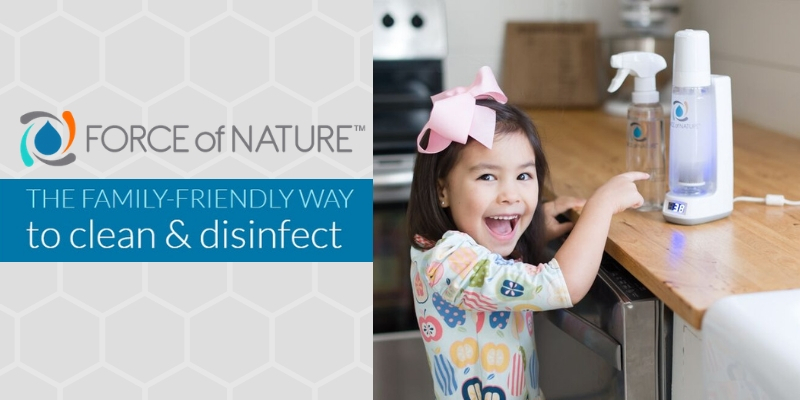 Gentle enough to use on baby toys without rinsing, yet powerful enough to replace bleach, Force of Nature is on a mission to help parents create healthier homes by taking the worry and toxins out of cleaning. The compact appliance uses electricity and a specially formulated capsule of salt, water, and vinegar to convert tap water into a cleaner and disinfectant that is 100% free of toxic chemicals yet still able to kill 99.9% of germs, including Salmonella, Norovirus, MRSA, Staph, Influenza A, Listeria & Pseudomonas. What’s more, Force of Nature can be used virtually anywhere in your house for any job requiring cleaning, deodorizing or disinfecting – even rugs and carpet! With Force of Nature, you don’t have to worry about exposing your family and pets to harmful chemicals to get your home sparkling clean. Tryazon will select 100 hosts for this opportunity. Those chosen will receive a party pack with a variety of Force of Nature products to showcase and sample with friends and family! Learn more about the products and party by clicking the tabs below! Co-Founder Melissa Lush started her hunt for non-toxic cleaning products when she became a Mom. Seeing her son put everything into his mouth made safety a huge priority. A playground accident sparked her wonder in the technology that eventually became Force of Nature. One day her son ran into a play structure and needed stitches. After he was bandaged up, she asked the nurse how wounds heal. The nurse mentioned hypochlorous acid, which is what the immune system produces to fight infection, and said that hypochlorous acid is actually used in wound healing products. Melissa did some research and learned that hypochlorous acid is created when electricity is applied to salt & water. In addition, it's been used for green cleaning & disinfecting in the industrial space for more than 50 years. Her background developing new products at Procter & Gamble led her to recognize the technology as one that just had to be adapted for families. With Force of Nature, Melissa aims to finally give parents a worry-free cleaning product with no compromises. Learn more about Force of Nature HERE . Understanding how Force of Nature works. Electrolyzed water is an industrial technology that’s commonly used for its efficacy yet lack of harmful chemicals, fumes & residues. The active ingredient, hypochlorous acid, is even used as the active ingredient in wound, eye & veterinary care products. Force of Nature creates electrolyzed water by using electricity to change the chemical composition of salt, water & vinegar. Learn more about the science behind Force of Nature by watching the video below. The fun begins in November, when parties will be hosted! This product has replaced about 80% of the cleaning products I used to purchase. It cleans, deodorizes, destroys grease, eliminates mildew, and leaves my home looking and smelling fresh and clean. I have recommended Force of Nature to all of my family members and friends.